Turn to this journal for briefings, analyses and updates on all aspects of law and regulation affecting banking institutions. The depth of coverage is as impressive as the range. From a close-up investigation of Canadian financial regulations before and since the global financial crisis, to a profile of New Zealand's regulation and governance of its non-bank financial sector, to insight for international banks on compliance with anti-money-laundering legislation in Malaysia, the journal presents sophisticated analysis, and in-depth, expert advice. 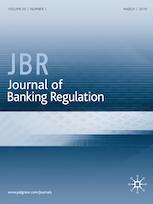 Published quarterly, the Journal of Banking Regulation offers detailed, insightful coverage of a wide range of relevant topics. Among the security issues addressed are deposit protection; banking supervision; enforcement decisions in banking regulation; corporate governance in banks; anti-money laundering legislation and regulations. International banking is also examined, with coverage of the Basel Accords, cross-border competition in banking services; international accounting standards; cross-border regulation; and cross-border bank insolvency. Management of funds is another area accorded extensive attention, including harmonization in banking markets; monetary integration; models for banking risk; credit risk supervision; capital adequacy; and systemic risk in banking operations. The Journal is an essential resource, benefiting a global audience of academics and researchers, central bankers, banking supervisors, financial regulators, compliance officers, risk management executives, policy makers, banking associations, attorneys who practice banking law, accountants and bank auditors both internal and external.